While the nation's eyes were on the Fernvale columbarium saga in Sengkang West early this year, six months later, many residents in the single-seat ward say the controversy is almost a non-issue to them. Plans to build the columbarium made headlines when buyers of the upcoming Fernvale Lea - Build-to-Order flats next to the plot - launched a protest, saying their sales brochures never mentioned it. They also questioned the decision to award a commercial firm the tender, when it involved land for religious use. However, at the local level, Sengkang West's young population is more concerned about not enough childcare places, amenities such as bus services, and eating houses. The new town has swelled dramatically in the past five years. Many new residents have young families. Since the single-seat district was carved out from Ang Mo Kio GRC for the 2011 General Election, resident numbers have doubled from 30,000 to 62,000. In fact, its voter population was a hefty 39,587 before the electoral boundaries committee got to work. 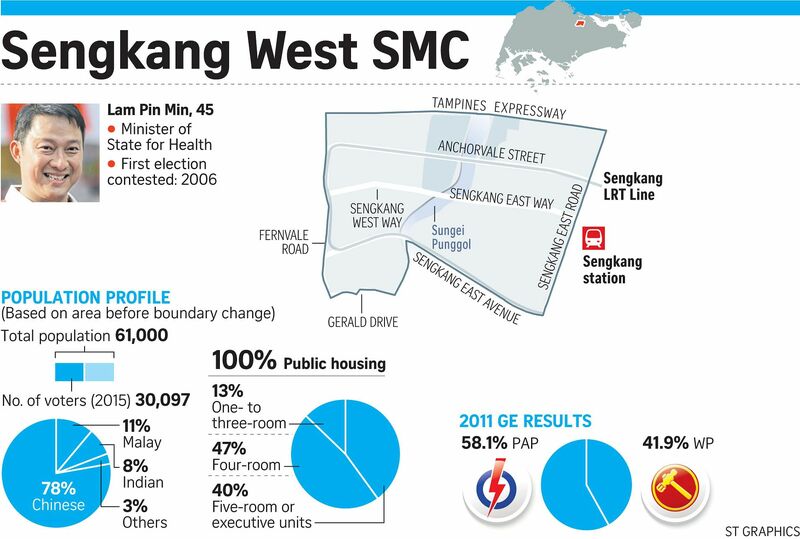 Last Friday, three polling districts on the western fringe of Sengkang West with 9,500 voters were absorbed into Ang Mo Kio GRC, bringing the SMC to a more manageable 30,097 voters. The influx of young families means Sengkang West has a high demand for childcare places, along with the typical growing pains of a new town, such as the lack of sufficient amenities. A feature of Sengkang West is that all of its homes are Housing Board flats for now, as the private condominiums to be built in the area are not ready yet. Nine in 10 of these HDB flats are BTO four- and five-roomers, which are popular among middle-income young couples looking to own their first home. Since 2011, 15 BTO developments with about 10,500 flats in total have been completed in Sengkang West. Take engineer Vanessa Tham, 33, who could not get her 18-month-old daughter a place in 16 childcare centres and was put on their waiting lists instead. At the end of her tether, the mum approached Sengkang West MP Lam Pin Min. She says: "He helped us get her a place nearby. It's five LRT stops away from home, but at least she has a school now." Dr Lam tells Insight he has been working with the Early Childhood Development Agency and HDB to increase the number of childcare centres in Sengkang West. Where suitable, void decks have been converted into, or set aside as, childcare centres. Fernvale Lea will also have a jumbo childcare centre with a capacity of 500, compared to the usual 80 to 100. It is scheduled to begin construction this September and be ready by the middle of next year. Says Dr Lam: "Demand for childcare is still increasing because more and more people are moving into Sengkang West. Some have kids, some are going to have kids." Also on the wishlist of residents are more feeder bus services serving the town. Now, they wait for several buses to pass before they can board one during peak hours. Corporate communications executive Michelle Pereira, 31, says: "The buses are very crowded. It should be a 15-minute drive from home to my workplace in Changi, but I take at least an hour." Residents also want more eateries near their homes for convenience, and note that there are so few in Sengkang West that the waiting times for food are long. Says account manager Cheryl-lyn Tham, 44: "On weekdays, we have to wait 20 minutes for our food. On the weekend or public holidays, it's a 30-minute wait." Residents note, however, that more eateries have opened, including in Seletar Mall along Sengkang West Avenue and the Anchorvale Community Club. Meanwhile, teacher Aravinthan Kumaran, 33, wants a supermarket nearer where he lives, while 30-year-old engineer Saadiq Majid simply wants more ATMs. Full-time national serviceman Raihan Sulaihan, 23, says: "I'd like more halal food options. Right now, the only nearby places... are in Jalan Kayu and McDonalds." On national issues, however, it's being able to provide for their families and themselves that gets residents' attention. Says Mr Nicholas Yeo, 33, who works in a bank: "As hard as we work, our salary raises can't catch up with inflation. Can the cost of living keep pace with my pay so I can provide for my family?" As for the columbarium controversy, most of the 30 residents Insight spoke to say it will not be a factor in how they vote. For one, many Fernvale Lea residents will not have moved into their new home by January 2017, the deadline for the GE to be held. The estimated completion date is the third quarter of this year. For others, it is a case of out of sight, out of mind. Mr Yeo, an Anchorvale resident, says: "It won't affect how I vote because I don't live near the site. Anyway, wasn't the columbarium plan abolished?" A new tender for a Chinese temple was called in May after the Government and a private developer said they would terminate a previous agreement. The saga took another turn when residents were upset that Dr Lam sat at the same table as the commercial developer at a dialogue session he had organised between them and the developer. This gave the impression that he was "against" residents, they said. Fund manager Jimmy Koh, 30, says: "He didn't seem to get the residents' arguments or to be fighting for residents. His stance was quite clear, that it's in the purchase terms and conditions. He seemed more on the side of the developer." In an interview with Insight, Dr Lam says: "I think I had the best outcome, considering MND (the Ministry of National Development) reversed the decision and the land is now up for tender. Probably some residents will still be upset, but we try to make good whatever we can." He adds: "Some netizens felt I was taking sides, which I was not." The episode taught him that "when we organise dialogues, we have to be mindful even of where we sit". THE LITTLE THINGS THAT MATTER? Certainly, it shows how issues can suddenly emerge from left-field. But netizen involvement is not all knee-jerk reaction - social media helps solve problems too. "I will usually tell residents, do tag me on Facebook if you have any feedback for me," says Dr Lam, explaining that doing so alerts him more quickly to estate issues. He checks his Facebook feed personally, immediately informing the town council - of which he is chairman - about issues that crop up. Real asset manager Evelyn Wong recalls how Dr Lam tackled the problem of an unevenly paved road near her home earlier this year. "He got HDB and the town council together, and it was solved over one weekend. He resolves most issues within a week. Once, he even responded to residents within the hour," says the 31-year-old. As to whether these "little things" will ultimately sway voters on the day, it remains to be seen.